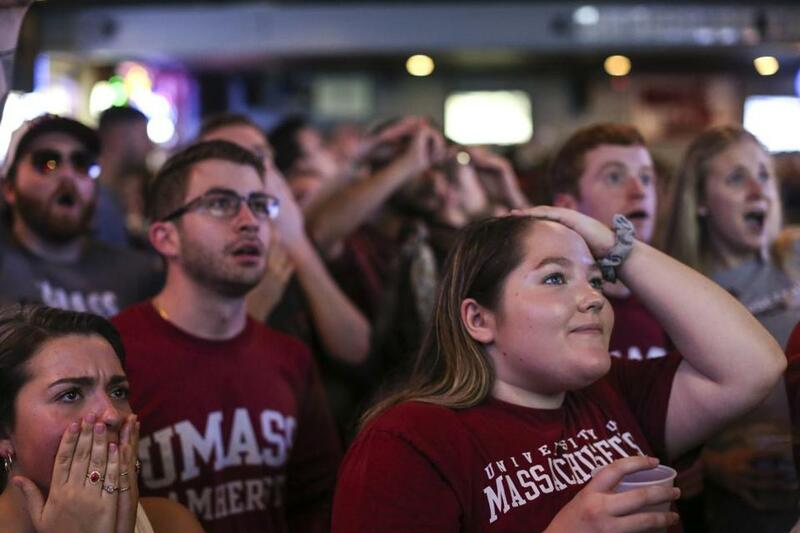 UMass Amherst students who watched the Frozen Four championship game at Spoke on Saturday night react to the impeding loss during the last seconds of the game. BUFFALO — When UMass star defenseman Cale Makar arrived at the podium for the postgame press conference after his team’s 3-0 loss to Minnesota Duluth in the championship game of the Frozen Four at Keybank Center, he had shed his equipment, as players customarily do. But Makar had put his red game jersey back on, with “Massachusetts” emblazoned across his chest, sans shoulder pads. But the reality is Makar won’t be putting on that jersey again, as the sophomore indicated after winning the Hobey Baker award Friday that he may sign with Colorado in time to play with the Avalanche in Game 3 of their first-round playoff series against his hometown team, the Calgary Flames. Coach Greg Carvel talked about what it has been like to coach Makar the last two years and all that he did for a program that won just five games the season before he arrived in Amherst. “I’m very proud of Cale,” Carvel said. “He came back this year. He didn’t have to do that. He’s a kid that sees the group ahead of himself, and he wanted to help take the program to another level, and he did that, and he did it with complete class every step of the way. 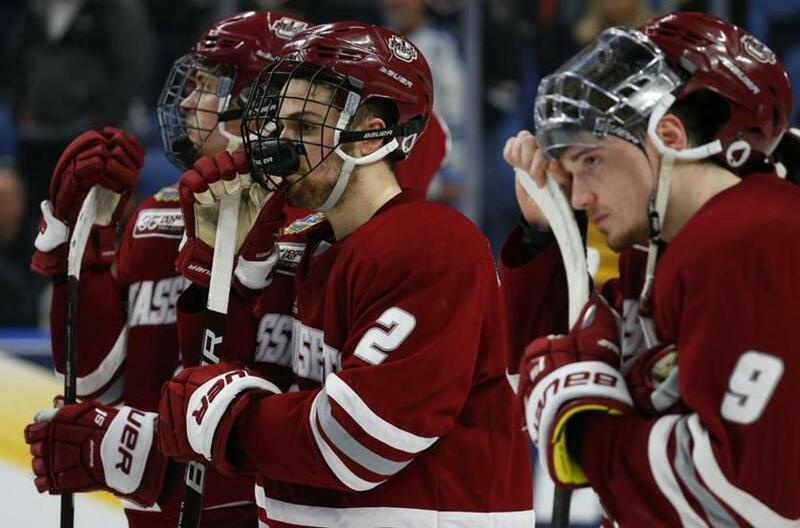 UMass players can’t hide their disappointment after losing to Minnesota Duluth in the NCAA men’s hockey championship game. The comment drew a laugh from the assembled media, as well as a smirk from Makar, who was seated to his coach’s left on the podium. UMass (31-10-0) had managed to figure out different ways to win over the course of its historic season. As recently as the Hockey East quarterfinals, the Minutemen found themselves trailing UNH, 3-0, only to storm back for a 5-4 win in double overtime. 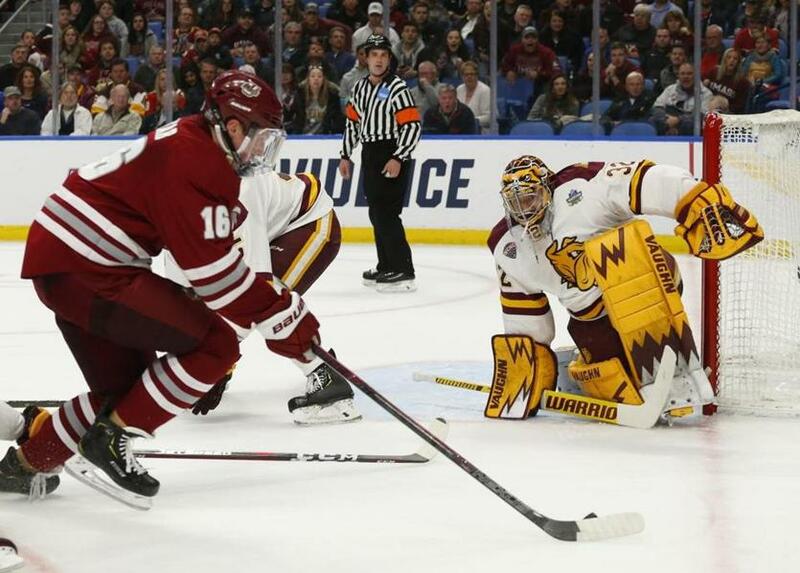 So when UMass entered the third period trailing Minnesota Duluth, 2-0, the Minutemen faithful might have thought they had a sliver of hope to cling to. But in some ways, the game already felt lost, as Duluth (29-11-2) entered the night with a 19-1 record when leading after two periods. The Bulldogs improved that mark to 20-1 after they added a goal late in the third period from Jackson Cates to seal their title-clinching victory over UMass and repeat as national champions. UMass was never able to get into a rhythm offensively, and managed just 18 shots on goal for the game. 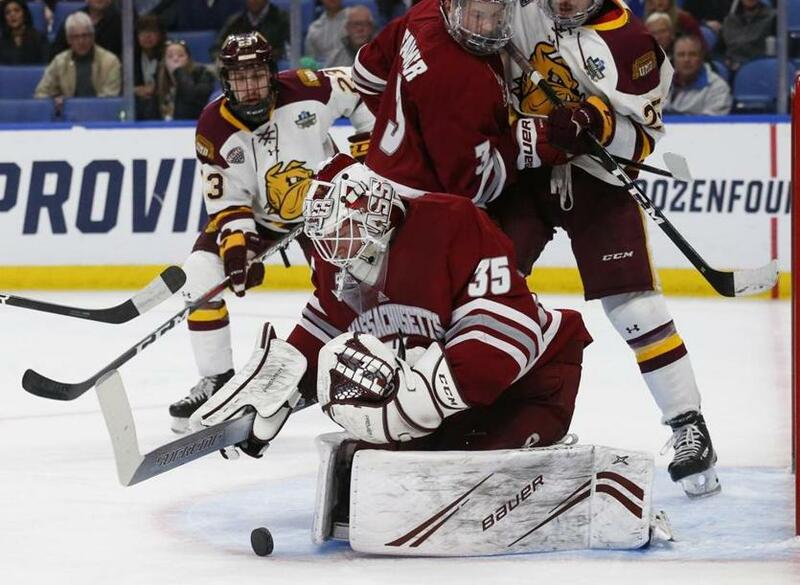 UMass goalie Filip Lindberg makes one of his 28 saves against the Bulldogs. The Bulldogs struck first with a power play goal when senior Parker Mackay flipped a backhander past UMass goalie Filip Lindberg (28 saves) with 16:09 remaining in the first period. Riley Tufte sent a pass across the zone to Mikey Anderson, who made a nice touch pass to Mackay cutting to the net. It looked like it was only going to get worse minutes later when Lindberg lost his stick as Duluth swarmed the net. John Leonard attempted to help his goalie by offering up his stick, but the exchange was botched, leaving both Leonard and Lindberg without a stick. Eventually, the puck was cleared, and Lindberg was able to retrieve his stick, while Leonard skated to the bench. UMass would go on the power play when Duluth’s Scott Perunovich hauled down Brett Boeing and was whistled for holding with 7:37 left in the first. The Minutemen failed to register a single shot with the man advantage, the nation’s best power play ultimately going 0 for 4. UMass was able to apply some pressure in the latter stages of the first period. Senior Kurt Keats had a nice opportunity, but was denied by Duluth goalie Hunter Shepard (18 saves). The game opened up in the second period, with each team getting breakaway opportunities, but neither squad was able to cash in. Duluth would score the only goal of the second period when Anderson scored with 4:12 remaining to give the Bulldogs a 2-0 lead heading into the third period. Duluth held a 25-12 shot advantage after two periods. Lindberg kept the Minutemen within reach. UMass defenseman Cale Makar looks to shoot on Minnesota Duluth goalie Hunter Shepard in the first period. 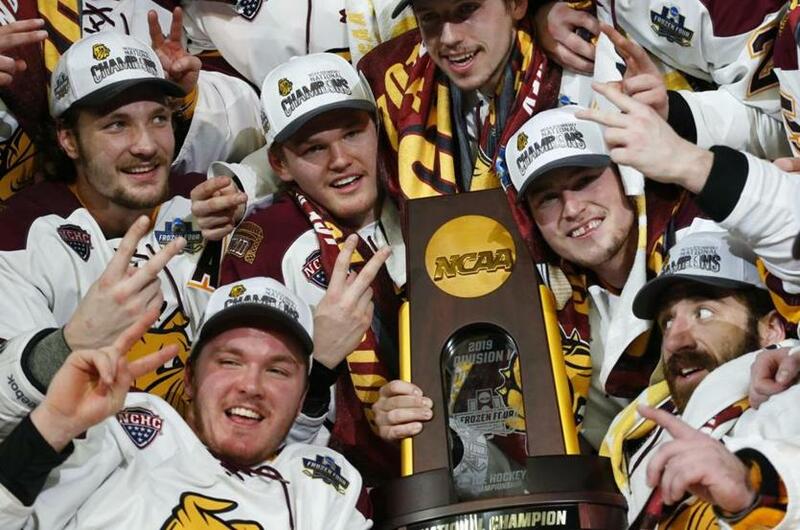 Minnesota Duluth players celebrate a 3-0 victory over UMass for the title.